Another weekend of fireworks display! 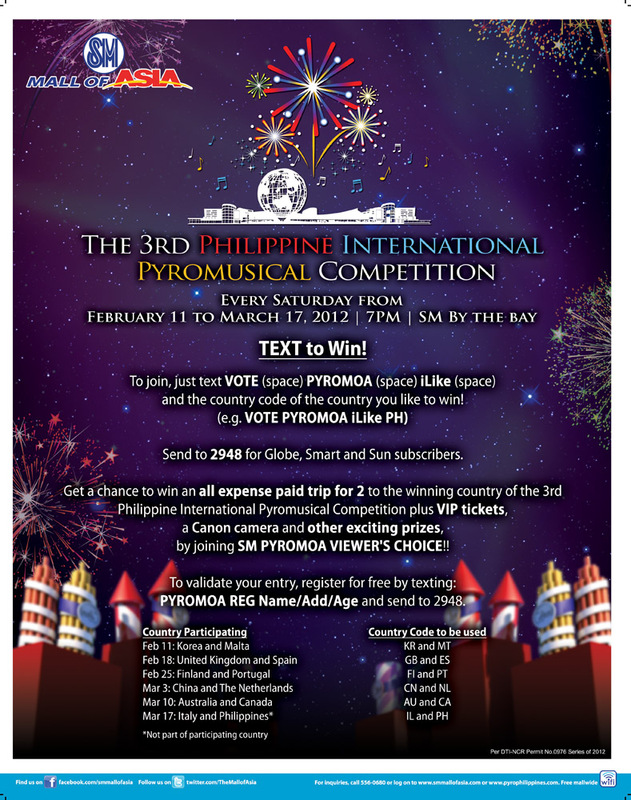 Again, we were at SM Mall of Asia to witness spectacular fireworks in the 3rd Philippine International Pyromusical Competition for the second time, featuring Finland and Portugal. It's best to be early to get a good spot. Last week, we were here for UK and Spain, (see my post here ) and a lot of people were already there with their cameras and phones to catch the best moments above. You can check out the schedule for upcoming countries who are about to present their magical piece this March. Be there and witness what's your best pick and you'll never know, you might won through their text contest, see here. Finland started the enchanting evening thru Oy Pyroman Finland Ltd., Finland's leading supplier of pyrotechnics and special effects. We were at the VIP section at the breakout area, to practice more on shooting fireworks with reflection (not really achieved it). It was definitely a nice experience being upclose, and I was happy with one pic (last pic for this set) as they burst beautifully for people to see. Lots of colorful and different styles of fireworks people enjoyed so I wasn't being attentive with the music played during this fireworks display hehe. Groupo Luso Pirotecnia representing Portugal has been one of the leader in the industry providing magnificent fireworks and pyrotechnics. For this set, I tried to shoot fireworks with some audience for a change, of course I will not be able to shoot with its source this time. The burst of fireworks were so huge its as if you're always amazed of every hit in the sky. i was able to watch the one last week.ang ganda! ang dami ko na na miss na shows!!! punta ka ba sa sat? Sayang hindi pako nakakapanood every Saturday kasi may duty ako... tanaw ko lang sya from the building... ang gaganda ng mga fireworks sa competition na 'to. hi. nice blog, very informative. nag search kasi ako about ilocos. and i'm starting to love traveling and your blog is very useful. definitely will be your new follower. keep posting. Very nice pictures. Thank you for sharing.